Airwheel Q3, Your Self-balancing Scooter and Your “Mr. Right” Making Your Life Easier. Abstract: Human never stops asking themselves how the future city and city transport would be like, and how people will solve the transport problems. Indeed Airwheel Q3 has answer these questions and Airwheel has showed us the road ahead. The quickly developing technology shortens the distance between us and the future. Especially in the city transport, Airwheel leads us to the future with the publication of Q3 electric unicycle. Based on the most advanced science and technology, Airwheel Q3 is developed to be the future solution of city transport. It’s a portable intelligent self-balancing scooter, but it has strong power and best battery performance. With the above features, Airwheel Q3 has been very popular among officer workers, students and single travellers. The top speed of Airwheel Q3 electric unicycle is 18Km/h, and the top bearing weight is 120Kg. For all such great energy inside, its theoretical minimum charging time will be within just 90 min. Moreover, Airwheel Q3 has been installed with the most advanced CPU and intelligent operating system; the performance is greatly increased and Airwheel Q3 is capable to work well in all complicated and severe conditions. The safety of consumers is the first consideration of developers of Airwheel Q3. All comfortable experiences are based on safety. So protection functions are taken into great consideration by Airwheel. In Airwheel Q3 functions including speed limit protection, low battery protection, tilting protection and safety instruction ensure that consumers enjoy a safe riding experience, and consumers’ safety also means that Airwheel Q3 is well protected and has a longer equipment life. Girls or women consumers always feel tired in a long shopping walk. Airwheel Q3 intelligent unicycle will help them to get rid of these troubles. Airwheel Q3 is small in size and very portable; even young girls can carry them easily. So these features make Airwheel Q3 a best gift for those who love shopping. Nowadays, more and more people flow to the city and put heavy burden on the transport. The slowed city paces make people waste too much precious time on their way to the destination. People are always haunted by the question as to how to choose a fast way for going a place. Airwheel Q3 is one of the best solutions to the all above problems. 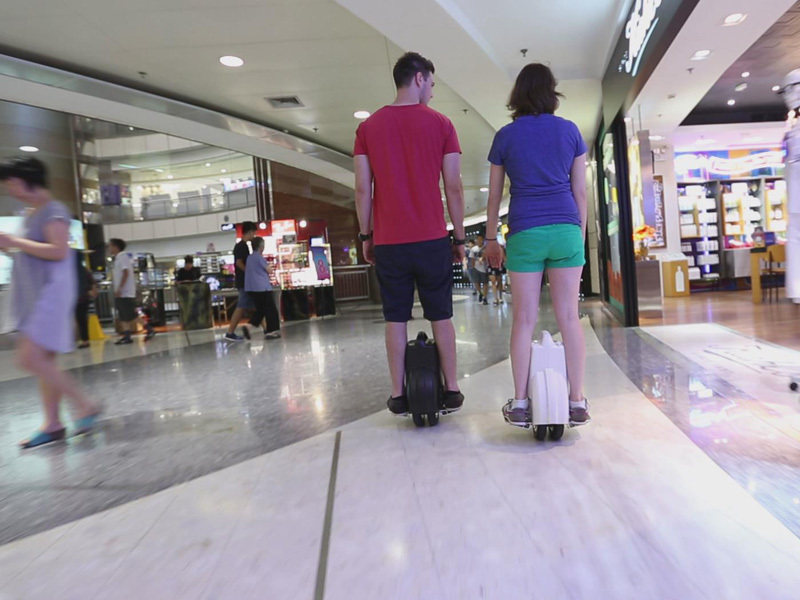 With an Airwheel Q3, consumers will easily move through the traffic jam and move freely in the crowds. And with its eco-friendly feature, Airwheel Q3 will also contribute to the environmental protection. The city transport will need more and more eco-friendly and convenient vehicles, so Airwheel Q3 is the future of city transport as the best option for efficient transport and environmental protection.